Ericsson (NASDAQ: ERIC) today announced a development partnership with Solar Team Eindhoven - a multidisciplinary team of 21 students from Eindhoven University of Technology in the Netherlands. 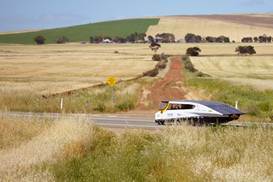 Solar Team Eindhoven won the inaugural Cruiser Class of the World Solar Challenge in 2013 - a 3,000 km race from Darwin to Adelaide in Australia - and will aim to retain its title in the second running this year. The World Solar Challenge is the ultimate race for solar-powered vehicles and encourages teams to push the limits of technology.